Whenever a book starts receiving an intense amount of pre-publication buzz, I am always a bit hesitant. I generally enjoy buzzed about books, though there are always a few that fall flat for me. Wither received a significant promotional push and as such it came on my radar very early, and I was extremely interested in reading it. When an egalley came available, I jumped at the chance to read it. 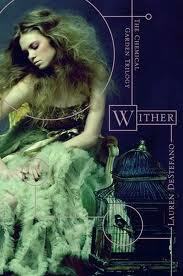 Wither is the rare kind of book that hooked me in within two chapters. DeStefano has created a compelling dystopian/apocalyptic world where the cure for cancer and perfected genetic engineering has created a dilemma no one knows the solution for. Men are dying by age 25 and women by age 20 from a painful virus. The first generation remains aging, but subsequent generations do not live past these ages. The world is at odds with two camps at war--one that believes a cure can be found, and one called pro-naturalism who believe this is the way it should be. As in any such world, the rich are at an advantage and they often kidnap young girls off the street. Some are sold into prostitution, while others serve as wives to the sons of the wealthy. Their purpose is to provide children and thus test experiments into the families. This is what happens to Rhine, our main character. Rhine stands out not only for her her blond hair, but also her eyes--which are two different colors. She is chosen as one of three sister wives for Linden. And so begins her new life. Rhine is unhappy having been tricked into this arrangement. She already has a bit of an independent spirit--her parents were scientists working on a cure for the virus. Her twin brother is left behind and she has no idea where he is. Many things happen to elevate Rhine's position in the household and her desire is to win Linden's trust so she can escape. The mansion they live in is amazing with many illusions and every entertainment they could possibly wish for. Rhine becomes close to her sister wives and a servant boy. Will Rhine eventually accept this new life with its own threats or will she continue to fight for independence and freedom? As I said, I was utterly sucked into this world and read the book in one afternoon, eager to find out what would happen to all of the characters. The premise is utterly dreadful...what would life feel like if at 16 you knew you only had four more years to live and not a lifetime ahead of you? Additionally, there's the added appeal of the polygamous relationship and it's many intricate workings--the closeness of the sister wives and how they balance their relationship with their husband. DeStefano draws her characters well, I could fully visualize who they were in my head and how they would act. I had strong feelings about them one way or another. There's also a creeping sense of dread throughout the narrative..what is in the basement? Who is Linden really? What will happen to Rhine? I do want to mention just how much this book reminded me of The Hunger Games. Clearly they are set in very different worlds, but certain story elements bore a strong resemblance to each other. There's of course the two boys in love with Rhine..one artist/intellectual from the upper class and one servant boy who thinks more practically. There's also the exploration of what is real and not real. There are so many fake things around the mansion, and Rhine questions even her "for show" relationship with Linden. Even to the point where she kisses him at one point because she's at a loss for what else to do. (this happens in every single The Hunger Games book with Katniss and Peeta at almost the same point in the story) Rhine herself, I believe to be quite different from Katniss and more like Mary from The Forest of Hands and Teeth--eager for freedom at all costs. I just found this really striking for some reason, considering how entirely different the two worlds in the books are....might just be that I'm reading too much. While I have some lingering questions on the set-up of the world, and exactly why things are the way they are, I'm content to live with them for now and go along for the ride. This is a fabulous compulsively readable book that envisions a darker future, where women are like cattle, and hope is dim, indeed. I am very curious about the direction the trilogy will go in..if it will continue to follow Rhine or branch out. I have so many questions about what took place in Wither and a desire to see the characters again.